Waiting for Japan’s economy to make a strong recovery has been an ongoing game since 1990. Shall we play that game one more time? There have been many false dawns in Japan over the past 20 years. Struggling with a combination of crushing debt and deadly demographics, Japan’s economy has stubbornly refused to make progress, despite numerous government efforts that range from currency devaluation to endless public works projects. None of this was enough, however, to prevent further declines in the country’s fertility rate, for example, which only exacerbated deflationary pressures on the economy. Nor were the collective set of policy measures enough to boot capital flows away from the bond market, as Japan’s savers simply kept on saving. For the past twenty years, value investors have probed the individual names in the Nikkei for cash rich insurance companies, debt-free manufacturing companies, and for rock-bottom low P/E names, all in the hopes of riding a broader recovery higher. Alas, no sustainable recovery in Japan’s economy or stock market has ever unfolded. Krugman explains that one of the problems with modern central banking is that people believe they’re too credible in their desire to stamp out inflation when it starts to pick up. So in other words, the Central Bank may say it will let growth and inflation run hot for awhile (so that nominal GDP can catch up to trend) but nobody believes that they’ll actually do that. What Japan may be in the process of doing — by having the Bank of Japan take orders from the Ministry of Finance and the new Prime Minister — is solve this problem, by having the bank commit to being irresponsible. Thankfully, Japan’s latest attempt to recover by aggressive devaluation is almost assured to provide resolution to its generational quagmire. But the outcome will not look anything like recovery. Instead, Japan has entered the terminal phase of its long, reflationary road. Culturally, the frustration and exhaustion at the country’s lack of progress has unsurprisingly led to this important juncture. The Japan recoverists are correct that the latest round of monetary policy “is not like the others.” However, the results are likely to provide a real-world test case of the limits of Keynesian policy at a time when the world faces scarce resources. This final chapter will be spectacular. So in a lurid sort of way, we should be thankful that Japan has now crossed the threshold and is ready to proceed to its denouement. Students of ecological economics should pay close attention. Japan is about to add itself as a test case. Ecological Economics is a thesis of elegant simplicity. Simply put, the economy is a subset of the environment – and not, as neoliberal economists would have you believe, the other way around. Economies can “grow” up to the limit of the natural resources which they can extract, or acquire. In a time of cheap resources, when the cost of inputs is extremely low, the importance of these inputs tends to be ignored. Thus, we can see the most obvious implication of environmental economics is that extraordinary profits can be harvested when the price of resource inputs is low and the purchasing power of consumers in the market place is high. This is exactly the condition that allowed post-war economies like Japan to reap gigantic capital windfalls during their post-war industrial phase. Additionally, it is also critical to point out that the prices of energy inputs in the post-war era were so cheap that it was not necessary for countries like Japan to own any such resources domestically. Indeed, as it’s well known, Japan is nearly barren of any large deposits of energy resources. Countries like Sweden, South Korea, and Japan during the 1945-2000 period essentially engaged in a kind of resource arbitrage: sourcing energy inputs from abroad and using them to manufacture high quality goods for export. If the resource-curse explains how countries rich in oil, copper, iron ore, and coal often wind up in a place of stagnation and corruption, bereft of innovation and diversity in their economies, then a country like post-war Japan received a kind of resource-poor blessing. Short of raw materials, Japan’s only choice was to become expert in using raw materials to get rich. And rich, indeed, did Japan become. But all things must pass. The greatest gains from Japan’s industrial arbitrage were harvested from after the war up to 1990. It would be impossible to exaggerate how much capital the country extracted from the world economy during this time. It would also have been impossible, given the tidal wave of that capital, for Japan to have avoided the asset bubble, whose bursting, just a decade before the new millennium, would prove so crippling. By the time Japan had hobbled into the year 2000, new low-cost manufacturers like Mexico, China, and other Asian countries had appeared on the scene to essentially imitate Japan’s post-war triumph. Economies consume natural resource inputs, produce useful services for people, and generate waste. Fed a steady diet of affordable energy, the global economy grew and produced waste for most of the post-war period. Until, of course, the energy shock of high oil prices and the bursting of the credit bubble halted growth, in 2008-2009. 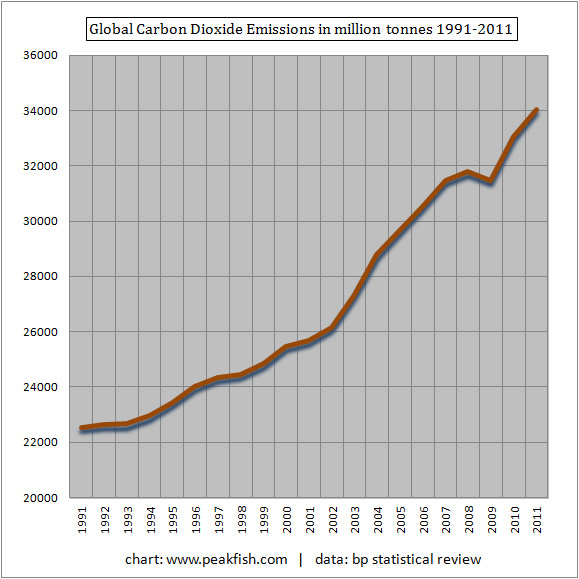 Global carbon dioxide emissions fell as expected during the crisis of 2008-2009, as global industrial output crashed. Since that time, the world has built GDP on the back of electricity supply – not oil supply – as the transition to natural gas and coal continued and moderate growth resumed. Japan fits into this picture in a very intriguing way, because of its new call on coal and natural gas in the wake of the Tohoku Earthquake. But here Japan has run into serious problems. Problems which will not ameliorate, but instead will worsen. After WWII, Japan followed precisely the kind of thesis laid out in Peter Diamandis’ book Abundance. In the view of Diamandis, history shows that humans are so amazingly innovative and productive that scarcity of natural resources is no barrier to successful economies. Diamandis argues that history shows that over time many natural resources are substitutable, or expandable in their supply. And that human-created technologies trigger revolutions in resource allocation and availability. Many of the enormous gains that Diamandis forecasts for the world in the next 20 years were captured by Japan after the war, as it ingeniously imported metals, rubber, silicon, oil, and other resources to make cars, electronics, and other highly engineered equipment. Indeed, Japan no doubt gave the world a number of energy-saving devices as its own economy became a hyper-efficient user of energy in its own right. Japan consumed its own products, as well, and became one of the lowest per capita users of energy while maintaining one of the most powerful industrial complexes in the world. The fifty years between the war and the new millennium was a time of price stability in global energy prices. Oil averaged, on an adjusted basis, at roughly $15 per barrel. Coal, increasingly rejected by industrial economies, was also cheap. And no other industrial economy took better advantage of these fertile conditions than Japan. Using a population not much bigger than Britain, Japan bulked up to become the third largest economy in the world with extraordinary industrial output. Those TVs, stereos, and of course automobiles, were manufactured using cheap imported coal, and oil. It is not a coincidence that Japan also seized the nuclear opportunity, starting in the early 1960’s. Yes, coal was still cheap, but Japan’s economic security demanded that a country naked of domestic energy resources look to securing its future. And that is how Japan seized both the miracle and the nightmare of nuclear power. Japan’s hyper-efficient, energy-conserving economy was not completely shielded from the new millenium’s price revolution in oil. 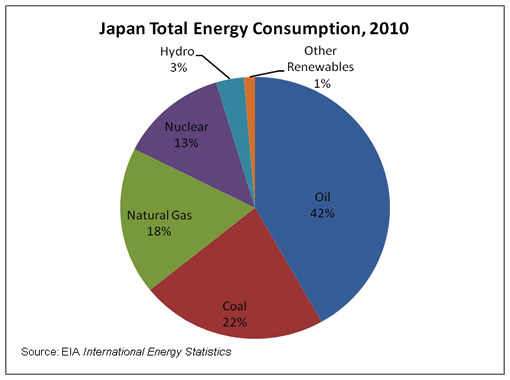 That said, Japan has done an extremely good job of bringing oil down to 40% of its total energy consumption mix. Japan can be still be thought of as a substantial user of oil, but, an even heavier user of electricity sourced from imported LNG, imported coal, and its own nuclear power. But the shock of the Feb 2011 Tohoku earthquake peeled back the risk on nuclear power in Japan. The problem, which I outlined in Returning to Simplicity (2012) is that dependency on nuclear power is synonymous with dependency on a tightly-coupled system. And, tightly-coupled systems are not robust. Rather they are fragile, and vulnerable to systemic failure. Worse, the Tohoku earthquake and tsunami arrived in Japan at the precise moment in the country’s history when debt levels, global demand for automobiles, demographics, slow growth in the OECD, and price levels for energy resources were all conspiring to merge. And not in a way beneficial to Japan. The nasty reality for Japan is that its cost of inputs are rising at the same time demand for its goods continues to soften. We must emphasize that Japan is an island, and so major upside surprises in new natural resource discoveries is highly unlikely. Except for its ability to lock in the price of inputs through large hedging programs, it is fully exposed to present and future prices of LNG, coal and other essential commodities. Indeed, Japan is the largest importer of LNG in the world, and global suppliers take advantage of this fact. In Part II: The 10 Next Predictable Steps to Japan’s Unfolding Disaster we focus on that what’s important to realize here: Japan’s economy is going to fail. And when it does, the outcome will have spectacular implications for many global assets, ranging from real estate, to stock markets, to oil and gold. For all others, this story is important to understand because Japan also serves as a bellwether for the other OECD countries, many of whom face similar macro headwinds of excessive debts and increased global competition for key commodities. As Japan goes, so very well may we all.